Looking for some nice glassware? Maybe for your seder? Get yourself over to Macys to score some great deals on Longchamp glassware. All four-piece glass sets are $9.99 (regularly $30), including highballs, tumblers, goblets, corials, old fashioned glasses and more. 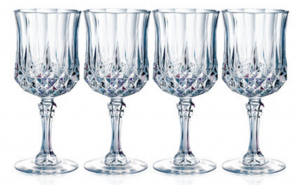 If you are looking for something a bit simpler, check out this Martha Stewart set of 12 wine glasses for $9.99, which I posted yesterday.